Summer Reading List: Growth is Dead, Now What? You are here: Home / Summer Reading / Summer Reading List: Growth is Dead, Now What? If you’ve got no interest in BigLaw, feel free to skip Bruce MacEwen’s short book Growth is Dead, Now What?, a study of “law firms on the brink.” For everyone else, it’s a good, quick read that’ll get you up to speed on the challenges facing large law firms — now and in the future. 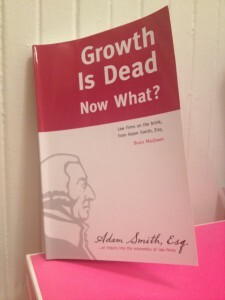 Growth is Dead collects 12 columns from Adam Smith, Esq. which collectively consider the current state of the BigLaw market, and where it’s likely to go in the future. MacEwen’s basic thesis is simple: the gravy train has ended. The days of stable, consistent growth rates are over, and large law firms are in a fight for market share (with each other) and relevance (with potential substitutes). What are the basic problems? Firms have excess capacity. Anecdotally, we’ve all heard about clients refusing to pay for first and second year associates, but MacEwen argues the problem is deeper than that, and goes to the basic structure of these firms (pyramidal vs. cylindrical). Pricing is under pressure. Realization rates (i.e., collected, non-discounted work) are down and clients are getting serious about alternative fee arrangements and sending work to lower-cost providers. Firms would prefer not to innovate. Innovation requires experimentation, and lawyers (on the whole) hate failure. Which, of course, is a necessary component of experimentation. The “lawyer personality” makes evolution very difficult. Lawyers, as a whole, are far more skeptical and autonomous than average, and far less resilient. This combination of characteristics leads to huge challenges for BigLaw managing partners trying to enact fundamental changes. Lawyers tend to think they’re special snowflakes, uniquely qualified to do anyone else’s job. Some might think this is an exaggeration, but I’ve seen it over and over (and heard it more times than I can count from law firm staffers and consultants). Who needs to spend money on expensive marketing people, or competent IT folks? Just get the cheapest ones and we’ll tell them exactly what to do! Ditto for professional managers. (Who needs those? The managing partner can take care of this stuff between trials.) Or anyone else interested in running an actual business. Being a law firm consultant, MacEwen isn’t going to give a one-size answer away for free (not that one exists, anyway). But he does provide four useful categorizations for firms of the future — three that have potential and one that’s probably dead in the water. Unfortunately (if you care about BigLaw), it seems to me that most firms at the moment are in the final category. It’ll be interesting to see how things develop. (As MacEwen points out, the profitability distribution has already started to spread out in the last few years, suggesting different strategies are yielding different results). In the end, no one can predict the future, as Growth is Dead readily admits. That being said, if you’re planning a career in BigLaw (or even a first job there), these are ideas worth considering quite seriously. Are you on our free mailing list? Sign up today and get the rest of the summer reading list sent right to your inbox.